We look for protection for our homes, our investments, and for ourselves. In Revelation 7 John shows you the ultimate form of protection—and he gives the purpose why you are protected. You have been sealed. The seal of the living God protects you. At the end of Revelation 6 as the wrath of the Lamb falls in judgment on the wicked, the cry goes out, “Who can stand?” (Rev. 6:15–17). Just as a movie or a novel may have a flashback, showing you background, Revelation 7 begins with four angels holding back the winds that damage the earth—destruction similar to that wreaked by the four horsemen. Destruction and judgment are coming, but first the Lord protects his own. In a scene that reminds you of Ezekiel 9 (where God has a marked placed on the foreheads of the godly before judgment falls on idolaters), the Lord has his seal place on the foreheads of his people. The seal marks them as genuine, as belonging to the Lord, and thus coming under his protection. As you read the Book of Revelation, God’s people are not promised protection from suffering in this world, but they are assured that both in life and death God will not forsake them. He will not allow the temptations to sin nor the opposition of the wicked to draw them away from him. The seal is further identified in Revelation 14:1 as being Christ’s name and the name of his Father (see also Revelation 3:12). The seal marks the recipient as belonging to God, as being his servant. You are the Israel of God. Those sealed are identified as 12,000 each from the tribes of Israel. The number seems to be a symbolic expression of fullness, 12 x 1,000 x 12. This listing of the tribes of Israel does not correspond completely with any listing in the Old Testament. Jacob (Israel) had 12 sons, but Dan is missing from this list, replaced by Manasseh. If you look at the geographic listing of the 12 tribes in the land, the place that Joseph would have had is taken by his two sons, Ephraim (not found here) and Manasseh. Levi is listed here, but was not assigned a geographic tribal area, instead the Levites were scattered among the other tribes to serve the Lord there. Revelation 14 identifies the sealed 144,000 as firstfruits, and that helps with the relationship between them and the great multitude. You are part of an uncountable multitude. You have washed your robes in the blood of the Lamb. Although some look at the multitude as specifically Gentile, as opposed the sealed Jewish believers, it’s more likely that John is giving us two different views of the same group—the people God has redeemed. That may seem strange at first, but remember that two very different symbols, the Lion and the Lamb, both point to the same individual—the Lord Jesus Christ. The covenant people of the Old Testament are the firstfruits (Revelation 14:1-4), but even the covenant promise to Abraham was that in him all the nations of the earth would be blessed, Genesis 12:1-3. They are uncountable and multinational. With the question of Revelation 6:17 echoing in your ears, “Who can stand?” the response is a huge multitude. They stand, not because of who they are or what they have done, but because they have washed their robes in the blood of the Lamb. Those whom Christ has redeemed are under his protection and care. They can be viewed as sealed on earth, enabling them to endure. And they can be seen as the glorious host of the redeemed, joining in a victory celebration. They have come out of great tribulation. Without denying profound suffering for the church at the end of the age, God’s people are called to suffer. Revelation lifts your eyes higher than the present difficult times. “As Judah’s Lion proved to be the slain Lamb, displaying royal power through the weakness of his sacrifice, so the flock he protects sounds like a precisely numbered, exclusively Israelite army braced for battle but looks like a countless, international crowd celebrating a victory already won. The victory was won by the Lamb when he was slain to purchase this multitude from the peoples to become God’s treasured kingdom of priests (5:5, 9).” (Dennis E. Johnson, Triumph of the Lamb, p. 133). Praise God! When you look at what the multitude is doing, you get a glimpse of the purpose Christ has in redeeming them. Think of Psalm 3:8 and 118. Think of the triumphal entry. Serving before the throne they are a kingdom of priests. Fellowship with God, singing praise to his name, ascribing glory to him—that is the purpose for which Christ redeemed you and all of those for whom he died. That vision encourages you to endure obediently, whether in the face of persecution of simply the temptation to live your life on autopilot, as though God doesn’t really matter. Live before the throne of God. No more: hunger, thirst, heat, or tears. The promises of Isaiah 49:10 and 25:8 come to their fulfillment, not just in Israel being brought back after the exile, but beyond that in the triumph of the Lamb on behalf of his people. The sufferings you face are present because you live in a fallen world, under the curse of sin. When the Lamb is slain and undergoes that curse for you, then, not only is the guilt of your sin removed, but eventually, the effects of sin are rolled back. Picture a father, gently brushing a tear from his daughter’s face. What a father on earth would like to do—make the hurting stop, solve the problem—but sometimes cannot do, the Almighty Father in heaven does to us, his children. The hurt and tears are real as long as we live on this earth. But there is comfort and hope! 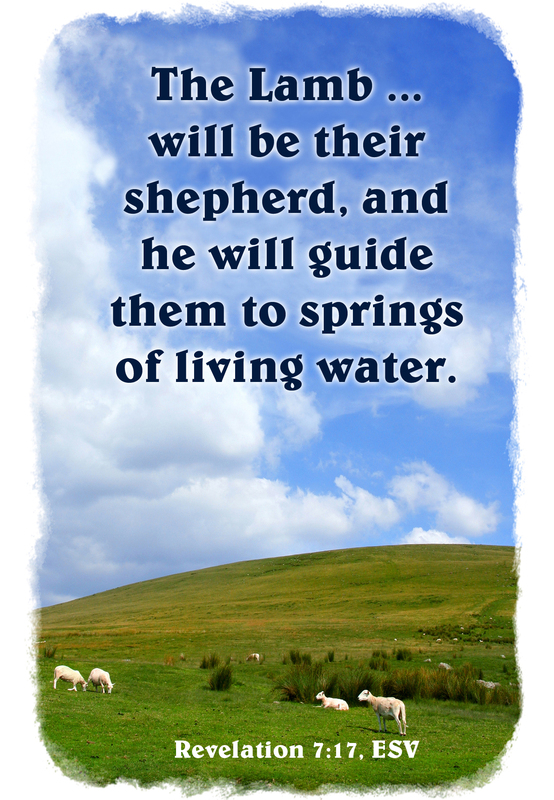 Trust the Lamb to be your Shepherd. One of the richest pictures of care of your Lord is Psalm 23, clearly echoed in the last verse of Revelation 7. Whether David composed the Psalm while on a hillside with his sheep or on a throne reflecting on how much more complicated it was to shepherd a nation, he looked to the Lord to be his shepherd. Countless times the suffering church as sung the comfort of this Psalm. Make that connection—but not so fast that you overlook something surprising in Revelation 7:17. The Shepherd of God’s people is himself the Lamb, not just any lamb, but the Lamb that was slain. He not only shed his blood so that your robes could be washed white, but he also understands the depth of your suffering. John had heard John the Baptist point to Jesus as the Lamb of God who takes away the sin of the world. He had recorded Jesus’ cry at the feast in Jerusalem, “If anyone is thirsty, let him come to me and drink.” The Lord comforts you with the assurance that he who is your Shepherd is also a Lamb, like you, his sheep. “[T]he reason for the picture here is to emphasize the identity of the Lamb with his people. He is the corporate representative of his saints. Therefore, just as he first suffered and received his reward at the resurrection, so his flock follow the same pattern in their own lives (see on 1:5, 9, 20; 2:14). He led them by the Spirit on earth and will lead them in person in the future.” (G. K. Beale, The Book of Revelation, p. 443). Near the end of his Gospel, John wrote that these things were written so that you might believe, and believing, have life in his name. As he records the vision Jesus showed him in Revelation, John has the same purpose. 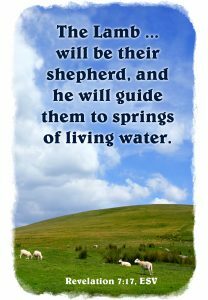 Are you trusting the Lamb who is the Shepherd?